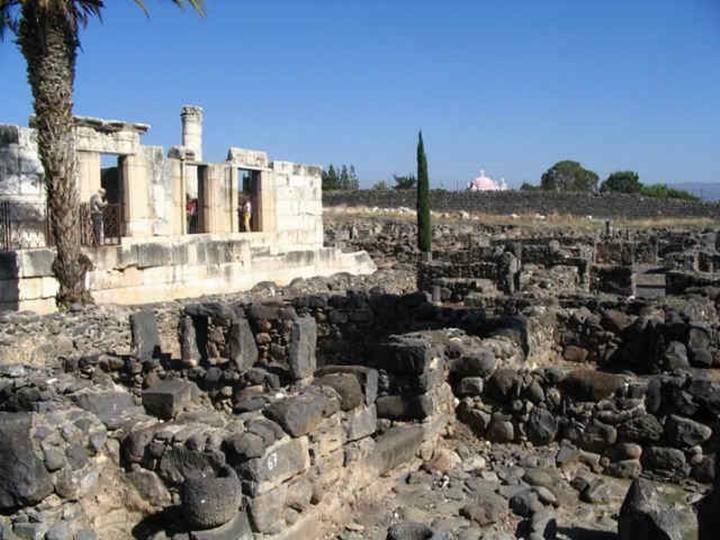 The village of Capernaum is on the northern side of the Sea of Galilee. Capernaum was the center of Jesus activities in the Galilee and his home town during that time. Jesus taught in the local synagogue. It was also the home town of the apostles Peter, James, Andrew and John, and the tax collector Matthew. A grand 4th C A.D. Synagogue was excavated, which stood over the Synagogue from the time of Jesus. Peter's house, and a Byzantine church built over it, were also excavated and reconstructed, as well as other houses of the Roman city. Luke 3:23: "And Jesus himself began to be about thirty years of age..."
Matthew 4:13: "And leaving Nazareth, he came and dwelt in Capernaum, which is upon the sea coast, in the borders of Zabulon and Nephthalim:"